From San Jose, 4 buses leave daily from the 11th/13th avenue; 0 street. From San Jose take the Highway #32 to Limon. Continue driving through Guapiles, Siquirres and Matina. Just before arriving downtown Limon you will pass through a cemetery. Continue on that road and then you will see the Cahuita/Puerto Viejo sign on your right. Turn here to the right and continue this road straight ahead south along the coastline. 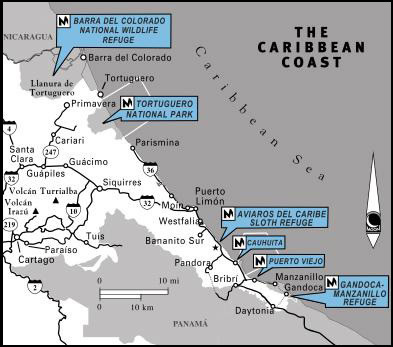 Driving to Cahuita will take about 3.5 hours from San Jose. For the best service companies and rates, please fill out our car rental form, and we will find you some good options. There are no local flights to Cahuita. The closest airport is in Limon. Interbus provides an efficient and economic shuttle service from the Central Valley (San Jose) to Cahuita, and on to Puerto Viejo. A reservation is needed 72-hour in advance!